Just 200 m from the Royal Palace and Royal Gardens, Ta Som Guesthouse & Tour Services is a 10-minute drive from Siem Reap International Airport. Fitted with tiled flooring, brightly painted rooms at Ta Som Guesthouse feature traditional Khmer decor and dark wood furniture. They are equipped with air conditioning, a satellite TV and a private bathroom. A minibar and free bottled water are included. 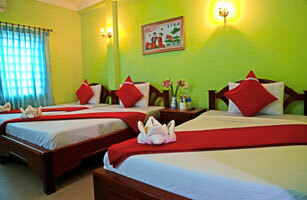 Guests can go for a massage, or choose from a selection of the hotel’s day tours to famous attractions in Cambodia. Ta Som offers free parking. Pets are not allowed on request. 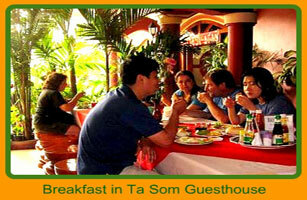 Ta Som Garden Restaurant offers breakfast daily. It serves traditional Khmer food, as well as Japanese and Western dishes. Stay 7 pay 6: Long stay saver!!! Stay 7 nights, pay only for 6 nights! Stay 6 pay 5: Super saver!!! Stay 6 nights, pay only for 5 nights! Stay 5 pay 4: Our hottest deal!!! Stay 5 nights, pay only for 4 nights! Stay 4 nights up, get one dinner complimentary!!! As our rooms fill up quickly during festivals and public holidays, please book in advance, to secure your special promotion! in a nice tropical garden! Our friendly, helpful and multilingual staff will assist you in any questions you have and provide you the best service during your stay. The charming Ta Som Guest House is ideally placed in the heart of Siem Reap, the gateway to UNESCO World Heritage Angkor. We are just 200 metres from the Royal Residence and Park area! 5 minutes walking to Central Market . 10 minutes walking to the Old Market, the French colonial town center. 5 minutes walking to National Angkor Museum. 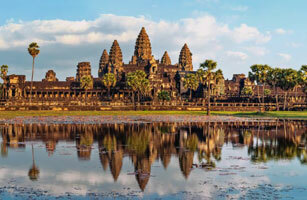 12 minutes drive to Angkor Wat! • ALL ROOM RATE ARE INCLUDED DAILY BREAKFAST. • We provide welcome drink & cold towel during check in. We offer free picking up service: 6am - 10:00pm. If you're staying only one night picking up service will be charged. Please complete the booking form, we confirm your reservation with 24 hours. We offer excellent Western and Asian kitchen. Traditional khmer food, choose among our delicious meals, like Lok Lak Beef and the famious Amok Fish (you should try it - not spicy!!) Enjoy a refreshing coconut juice or tropical fruit shake! Your companion to ancient Angkor and to remote destinations off the beaten tracks!​​ Our special: As Ta Som Temple gave the name to our guesthouse and tour agency, this marvellous temple is included in all our Angkor tours!